Those of you who pre-purchased Deus Ex: Human Revolution through Steam can begin pre-loading the game files now. If you still haven't ordered your copy through Steam, note that you can get a 10% discount in addition to eight new Deus Ex-themed Team Fortress 2 items. The Machina (Sniper rifle) - Fully charged, its bullets penetrate players and cause 15% more damage. However, it only fires when zoomed and its bullets are tracer rounds. The Diamondback (Revolver) - You earn one critical shot for every building that's destroyed while your sapper is attached to it. The trade-off is 15% less normal damage and no random crits. The Widowmaker (Shotgun) - 100% of the gun's damage is added to ammo and no reloading is required. On the downside, the gun uses metal for ammo and each shot expends 60. The Short Circuit (Pistol) - Fires an electric field that damages players and projectiles alike. The gun uses metal for ammo, uses 35 ammo per shot, and has no random crits. Human Revolution will be released on August 23rd in North America and on the 26th in Europe. 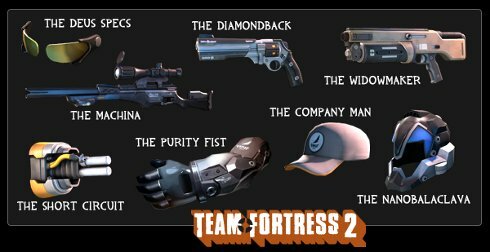 However, you should be able to get these TF2 items as soon as you make your pre-purchase of DX. Perhaps they'll help you pass the time until DX's arrival.